Price controls are governmental restrictions on the prices that can be charged for goods and services in a market. The intent behind implementing such controls can stem from the desire to maintain affordability of goods, to prevent during shortages, and to slow inflation, or, alternatively, to ensure a minimum income for providers of certain goods or a minimum wage. There are two primary forms of price control, a price ceiling, the maximum price that can be charged, and a price floor, the minimum price that can be charged. The Roman Emperor Diocletian tried to set maximum prices for all commodities in the end of the 3rd century CE, but with little success. During the French Revolution the General maximum or Law of the Maximum was instituted setting price limits on the sale of food and other staples. Governments in planned economies typically control prices on most or all goods, though these schemes have not sustained high economic performance and have been almost entirely replaced by mixed economies. Price controls have also been used in modern times in mostly free-market economies for such things as rent control. Wage controls have been tried in many countries to reduce inflation, but this is seldom successful. Modern neoclassical economic theory supports the alternative remedy of reducing the money supply, proposing that monetary inflation is caused by too much money creation by the central bank. The National Board for Prices and Incomes was created by the government of Harold Wilson in 1965 in an attempt to solve the problem of inflation in the British economy by managing wages and prices. The Prices and Incomes Act 1966 c. 33 was a United Kingdom Act of Parliament, affecting UK labour law, regarding wage levels and price policies. It allowed the government to begin a process to scrutinise rising levels of wages (at around 8 per cent per annum at that time) by initiating reports, and inquiries, and ultimately giving orders for a standstill. The objective was to control inflation. It proved unpopular after the 1960s. States have sometimes chosen to implement their own control policies. California controls the prices of electricity within the state, which conservative economist Thomas Sowell blames for the occasional electricity shortages the state experiences. Sowell said of California's controls in 2001: "Since the utility companies have been paying more for electricity than they were allowed to charge their customers, they were operating in the red and the financial markets are downgrading their bonds." California's price-setting board has agreed to raise rates, but not as much as the companies were paying on the wholesale market for their electricity. Economist Lawrence Makovich contended, "We've already seen in California that price caps on retail rates increased demand and made the shortage worse and price caps also forced the largest utility, Pacific Gas and Electric, into bankruptcy in four months." While some charged that electricity providers had in past years charged above-market rates, in 2002 the San Francisco Chronicle reported that before the blackouts, many energy providers left the state because they could make a greater profit in other Western states. The Federal Energy Regulatory Commission stepped in and set price caps for each megawatt of power bought, after lifting the caps to avoid rolling blackouts six months previously. The primary criticism leveled against price controls is that by keeping prices artificially low, demand is increased to the point where supply can not keep up, leading to shortages in the price-controlled product. For example, Lactantius wrote that Diocletian "by various taxes he had made all things exceedingly expensive, attempted by a law to limit their prices. Then much blood [of merchants] was shed for trifles, men were afraid to offer anything for sale, and the scarcity became more excessive and grievous than ever. Until, in the end, the [price limit] law, after having proved destructive to many people, was from mere necessity abolished." As with Diocletian's Edict on Maximum Prices, shortages lead to black markets where prices for the same good exceed those of an uncontrolled market. Furthermore, once controls are removed, prices will immediately increase, which can temporarily shock the economic system. 1 2 Rockoff, Hugh (2008). "Price Controls". In David R. Henderson (ed.). The Concise Encyclopedia of Economics (2nd ed.). Indianapolis: Library of Economics and Liberty. ISBN 978-0865976658. OCLC 237794267. ↑ Alston, Richard M.; Kearl, J.R.; Vaughan, Michael B. (May 1992). "Is There a Consensus Among Economists in the 1990's?" (PDF). 82 (2). American Economic Review: 203–209. Retrieved October 17, 2015. ↑ "File: "Prices charged in this store will not exceed those indicated in the most recent list of Fair Prices applicable to this – NARA – 512556.jpg – Wikimedia Commons". Retrieved 2012-01-21. ↑ "File: "Closed. Public Notice. For Violation of the rules of the United States Food Administration This Place is Closed days... – NARA – 512564.tif – Wikimedia Commons". Retrieved 2012-01-21. ↑ "File: "This Store sells at FAIR PRICES as interpreted by U.S. Food Administration...", ca. 1917 – ca. 1919 – NARA – 512714.tif – Wikimedia Commons". Retrieved 2012-01-21. ↑ "File: "We violated the regulations of the Food Administration but have pledged Full Obedience in the Future. ", ca. 1917 – ca. – NARA – 512528.jpg – Wikimedia Commons". Retrieved 2012-01-21. 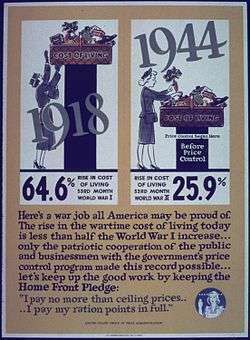 ↑ "File: "Cost of Living 1918–1944" – NARA – 514088.jpg – Wikimedia Commons". Retrieved 2012-01-21. 1 2 Sowell, Thomas (2001-01-11). "The Cause of the California Electricity Shortages: "Price Controls"". Capitalism Magazine. Retrieved 2008-11-03. ↑ "Power problems". NewsHour with Jim Lehrer. PBS. 2001-01-04. Retrieved 2008-11-06. 1 2 "Power struggle". NewsHour with Jim Lehrer. PBS. 2001-06-20. Retrieved 2008-11-06. 1 2 Martin, Mark (2002-05-10). "Memos show makings of power crisis". San Francisco Chronicle. Retrieved 2008-11-06. 1 2 3 Walter J. Wessels, Economics (2000), pp. 232–33. ↑ Lactantius. "CHAP. VII.". On the Deaths of the Persecutors. ca. 300 (Christian Classics Ethereal Library ed.). Calvin College. ↑ "George P. Shultz (1972–1974)". Treasury.gov. 2010-11-20. Retrieved 2013-09-27.